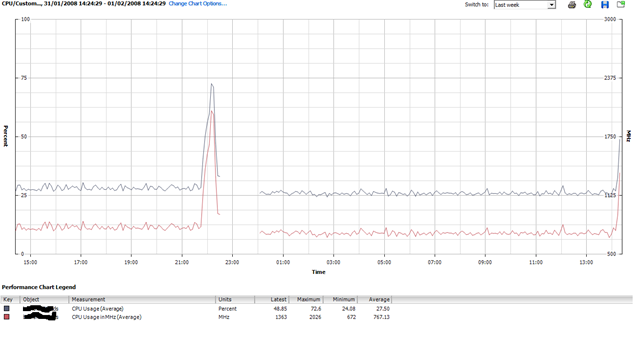 I thought I’d post some performance graphs from my cheap HP D530 ESX server using the Virtual Centre console (which incidentally, is good for getting this info quickly and simply). 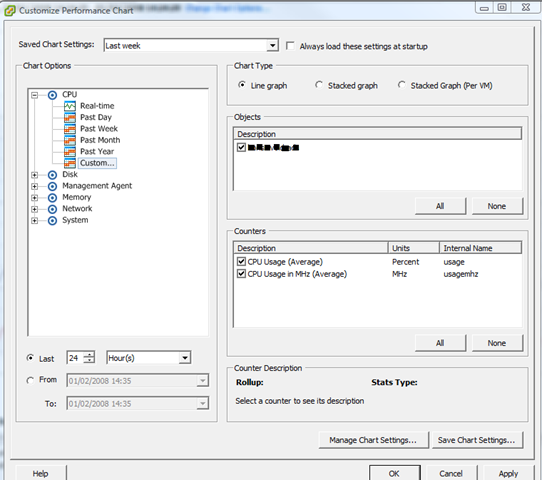 Screenshot of the UI for querying performance stats. As I noted elsewhere on my blog it has 4Gb RAM and a single 2.8GHz HT CPU – and with this VM load it gives an average CPU load of 25-30%. 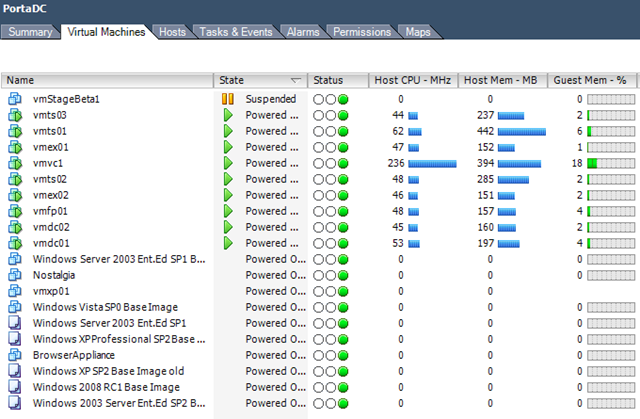 Almost all of these VM’s are idling but all respond in good time to network access/TS etc- not bad at all for a desktop PC! The big spike around 22:00 was when I cloned up a whole load more VM’s – seems to have upset the stats so need to try and have a look at that..
It’s also interesting to note that I added 4 Windows 2003 VM’s last night but that hasn’t actually increased the overall CPU average – ESX must be quite efficient at time-slicing all those idle VMs. I had 3-4 “deploy from template..” operations going on at the same time and it really bogged down the performance of the VM’s (usable, but only just..) but it is just a single SATA disk drive so I can live with that. Deploying 1 VM at a time had little or no impact – slight CPU spike to ~50% as you’ll see to the far right of the chart as I kicked off another one just now. When i get time I’m going to drop some jobs into the VM’s that will tax the virtual CPUs a bit more and compare results – maybe some Folding@Home activity Mmmmm that would definitley tax it. Hi, man i have read about the d530 pc compatible with esx, in some blogs, but i have some dudes. so it´s really works fine, you have 9 virtual machines in the picture at time working good? with 4gb ram? And about the disk, this pc have 40 gb sata disk by default, any sata disk would be compatible isn´t it? I´m thinking about take me one of these for ebay…Tell me some of this answer to decide to order one of this. This pc has sata disk or ata, cause i have been some d530 with ata, ATA isn´t compatible? Yeah 9 VMs concurrent no problems, infact at the moment I’ve got 12 running.. worth noting that they are not doing a lot (i.e no real users) but even if I crank up the CPU usage the other VMs are still usable. its not a “production” system – but works fine for home/experimenting. Any SATA disk should be compatible as its just the on-board controller that has to be compatible with ESX, I’ve got a single 500Gb SATA and its cool – as you say ATA isn’t supported by ESX so won’t work. My name is Gavin Whittaker and blog writer at http://www.speeddemonit.co.uk. I am contacting you as I have been looking at various IT blogs recently as I want to guest write for others, and, allow others to do the same on my site. I’m sure you’re very aware of the benefits guest writing on others blogs brings, not to mention raising your online profile.